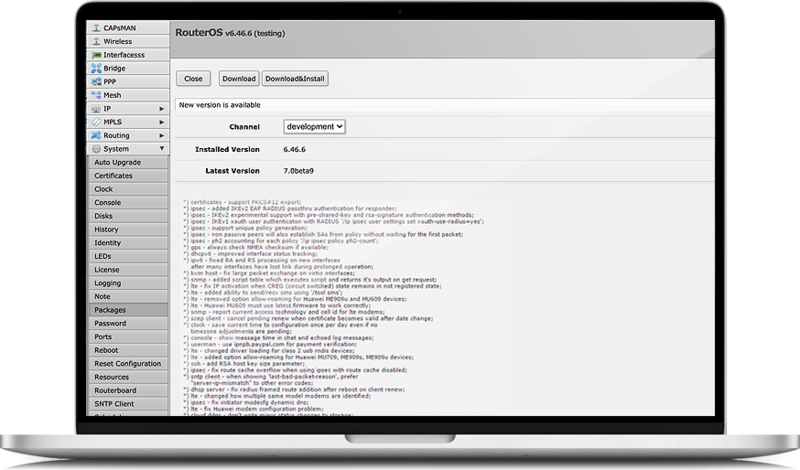 If you are already running RouterOS, upgrading to the latest version can be done by clicking on "Check For Updates" in QuickSet or System > Packages menu in WebFig or WinBox. See the documentation for more information about upgrading and release types. To manage your router, use the web interface, or download the maintenance utilities. Winbox to connect to your device, Dude to monitor your network and Netinstall for recovery and re-installation. Click on changelog link to view changes in current and previous versions. Click on MD5 link to view MD5 hashes of files.